It was a particularly hot July day in Tulsa Oklahoma and 19-year-old Don Cotner, a young college student at Oklahoma A & M, was looking for a way to escape the heat. As he passed a local church a large hand-painted sign advertised an Ice Cream Social. Don made a snap decision to stop and have a cold bowl of ice cream. Upon entering the hall, he couldn’t help but notice a very attractive young woman scooping ice cream and laughing with her friends. Don made sure to get in her line. Later that young woman came out and introduced herself to Don as Jean Riesinger. The year was 1941 and neither of them had any way of knowing that they would soon live through one of our nation’s most defining moments. December 7th, 1941 Japan attacked Pearl Harbor and changed the lives of many Americans. Luckily for Don and Jean, that chance meeting over a bowl of ice cream would provide them with a relationship that would sustain them through the difficult times ahead and across the next 66 years. After that first meeting Don and Jean began corresponding by mail. Their letters started out breezy and flirty, but that day in December would change things for them. 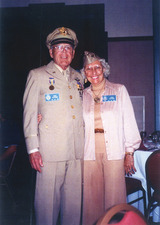 On Pearl Harbor day both Don and Jean sat down and wrote very serious letters, examining both their personal concerns and their fears for our country. They discussed their own relationship and what this national nightmare might mean for their own future. Don soon joined the Air Corp Reserves and not too long after he also asked Jean to be his bride. In 1943, Don was called up by the reserves and sent to Yale University, where he studied aircraft maintenance engineering. 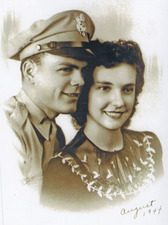 Just months later Jean arrived, and on December 4th 1943 Don and Jean were married by an Army Chaplain in a little chapel on the Yale campus. It was a beautiful wedding, but there wasn’t much time to celebrate. Don was back to work the following day, preparing for what was to become one of America’s greatest military maneuvers. Of course it wasn’t all serious business there were small moments of levity, however brief. Like the days when Captain Glenn Miller would lead his military band across the New Haven Village Green playing traditional military marching tunes in a swing time tempo. And of course, as busy as Don was, he always had Jean waiting at home for him at the end of his shift. So began months of crisscrossing the country from military base to military base as Don received more and more training. First stop, Seattle where Don learned first-hand the intricacies of America’s newest flying machine, the B29 bomber. Dubbed the “Super Fortress” and the “Queen of the Stratosphere” it was the largest bomber the world had seen, with the greatest load capacity and speeds never before dreamed of. In Denver, Don received his “wings” and then took off for Nebraska where he joined what would become his “family” for the duration of the war, the 9th Bomb Group. Ever faithful, Jean followed Don from post to post keeping the home fires burning, until finally a newly pregnant Jean returned to her parent’s home while Don and his fellow crewmen took off from Harrington, Kansas for the great unknown. Once in the air the Captain opened their sealed orders and confirmed what most of the men had suspected, they were headed for a tiny island in the Pacific and the war against Japan. After a three day stopover in Hawaii (where Don joined a group of guys who snuck off base to try their hand at surfing), they headed out to what would become their home for the duration of the war, Tinian Island. Located in the middle of the Pacific Ocean between Guam and Saipan, Tinian was approximately 1,500 miles from Tokyo and the perfect vantage point to wage an aerial assault on the Japanese. In the days that followed Don would fly 33 missions, dropping bombs up and down the Japanese coast. Each mission was a harrowing experience and always offered the chance that he would not return to Jean or his newly born daughter. At the start of each mission Don would place a photo of Jean within eyesight of his work station. The photo, taken by Jean’s mother, shows a beautiful young Jean lounging in a pin-up style bathing suit, holding baby Donna Marie. As his plane headed into dangerous territory Don would dream of his lovely wife and pray to survive to be a daddy for his newborn baby. And survive he did. When the war ended Don returned to his wife and young daughter and it wasn’t too long before second baby, Laura, joined the family. In another attempt to escape the Oklahoma heat, the Cotner family moved to California and eventually settled in Orange County, where the weather was just right. Don went to work for the County of Orange as an engineer and Jean stayed home to raise the family, which now included daughter Fran. The Cotners’ led a very active life and even in their 60s were competing around the world in the “Masters Track and Field” program for active senior citizens. They were both very competitive and Jean at one time was a world champion speed walker for women in her age group. Years have passed but Don and Jean have never slowed down. It was over 40 years ago that Jean discovered yoga and became a certified yoga instructor. Today, at 86-years-old, she is still teaching yoga for both the city of San Clemente and the city of Dana Point.